The Queensland Tennis Centre hosts a range of annual tournaments, available for tennis enthusiasts to get involved in, be it on the court or from the sideline. If you are looking to experience a competition-based environment while furthering your tennis skills, the Queensland Tennis Centre offers a variety of tennis tournaments to participate in. 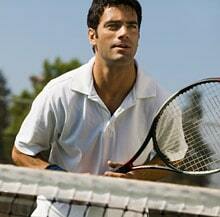 Tennis players of all ages and abilities are encouraged to join in and take their game to the next level. Enjoy tennis tournaments off the court as well with the annual Brisbane International, which is held at the Queensland Tennis Centre in January.